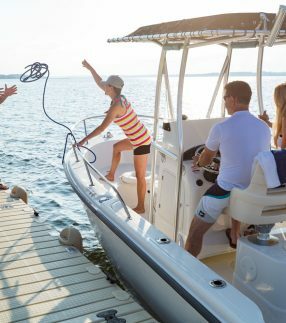 The family boater has unique boating needs. Parents, grandparents and children alike all need easy access to the boat or personal watercraft for boarding, fueling, maintenance and covering. The EZ Dock drive-on boat lifts, Sea Doo docks and PWC floating docks, as well as the EZ Dock floating walkways provide all those conveniences and more. For the family boater, the EZ Dock acts as their ideal watercraft management system, providing dry-docking, walk-around room, access at water’s level, and safe boarding and disembarkation. And since not every member of the family has the experience of a sea captain, all EZ Dock systems are designed to be used by one person, of average strength, by themselves at any time. This is a ideal for the family that has more to do than spend the weekend at the boat ramps or battling with a mechanical lifting device. The EZ Dock floating walkway docks are also ideal for the family boater and can be connected to your sea doo dock or PWC floating dock. Soft, cool, lightly-colored modules are splinter-free and contain no wood, metal or rusting hardware. The portable, modular and infinitely changeable design means your EZ Dock floating docks will grow with the ever-changing needs of your family. The Lifetime Warranty means your EZ Dock will grow with the children, serve the parents well into retirement, and be passed down through the family for years to come – truly an investment in a lifetime marine building block! Learn more by contacting your nearest EZ Dock dealer.